Picture shows parish council chairman Ian Lamble and DCP's David Hamilton with the cheque. A cheque for £677.13 has been handed to the Skerne and Wansford Parish Council for maintenance of its garden area near Wansford Lock. 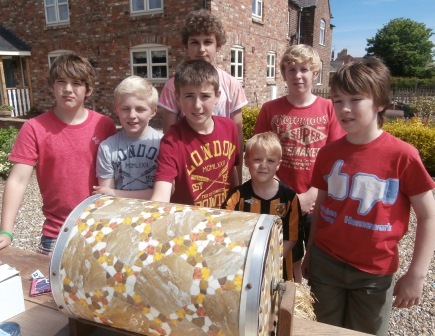 The money is the Driffield Canal Partnership's dispersal fund. The organisation is winding up, feeling that it has fulfilled its purpose of bringing together and into dialogue all parties with an interest in Driffield Navigation in whatever capacity. The cheque was handed to the parish council chairman, Ian Lamble, last Wednesday. The parish council will ringfence the money for the ongoing maintenance of its flower beds, benches, bus shelter, information board and picnic table at the lock. The lock and its environs, its fixtures and fittings and the adjacent permissive path, as with all the navigation assets, are the responsibility of the Driffield Navigation Trust and maintained with the assistance of Driffield Navigation Amenities Association volunteers. Wansford Village Hall was crowded when Happy Jack was staged at Wansford Village Hall on Saturday September 16. The event, a collaboration between Wansford Village Hall Committee and the Skerne and Wansford Parish Council made a modest profit of £46. The two-act production by renowned Yorkshire playwright John Godber focused on the fortunes of a couple living in a Yorkshre mining village and was inspired by Godber's own grandparents. It was presented by the Leeds-based Library Theatre Touring Company, which, last year brought two Alan Bennett monologues to the village hall in a sell-out performance. Tickets are £6 from parish cuncillors or the clerk. 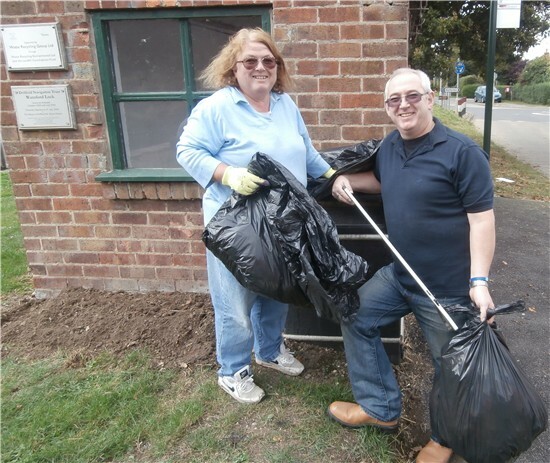 Parish councillors met on Saturday morning (April 30) for a litter pick, clean up and a spot of gardening around Wansford Lock and in the village. 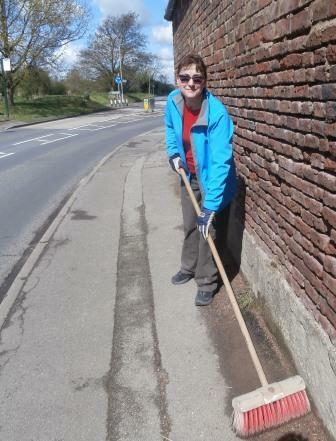 Picture shows Coun Caroline Harrison making a clean sweep. Skerne and Wansford are set for a period of interregnum due to the retirement of priest-in-charge the Rev Brian Lees last week. More detail concerning service and arrangements in the spring newsletter. 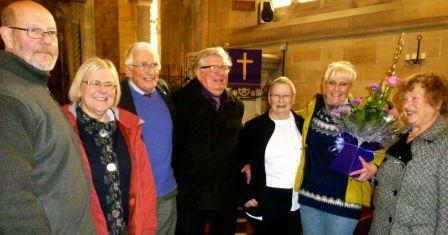 Pictured at the farewell event at Wansford are Mr Lees and his wife, Caroline, second from right. Keith Pick becomes the first person to try out the bench after he and Jim Stockwell installed it. 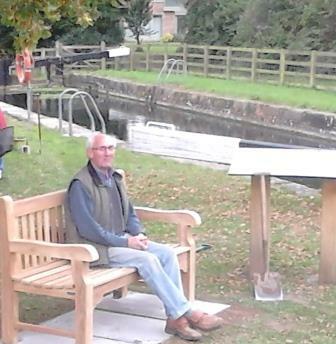 A new bench has been installed at Wansford Lock thanks to the Nafferton Feoffees Trust, which has given the Skerne and Wansford Parish Council permission to use leftover cash from its Wansford in-bloom scheme grant for the purchase. The £1,200 Feoffees grant was largely taken up with planters, troughs etc: however, in excess of £400 was left, mainly thanks to the ongoing generosity of Rob Smith, of Whinhill Nurseries, Wansford, who insisted on donating the majority of plants used in the scheme. 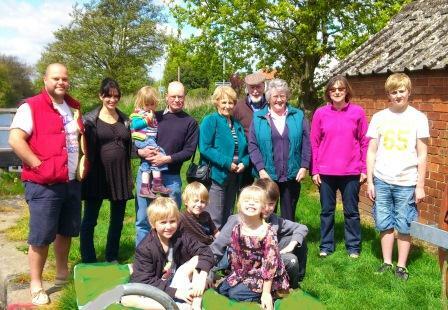 Subsequently the parish council contacted the Feoffees, which agreed that the money could be put to an alternative use. The bench was installed this week by Jim Stockwell and Keith Pick, in time for the official opening of the interpretation board and small memorial to ex parish councillor and former village postmaster Bryan Hills, scheduled to take place on Saturday October 17 at 2pm. This will be followed by light refreshments in the Wansford Village Hall. Keith Pick and Jim Stockwell putting the board in place. A small ceremony is to take place on Saturday October 17 to formally open both the interpre-tation board sited at Wansford Lock and the proposed memorial to former Wansford postmaster Bryan Hills. Funded by public donations, the memorial to Bryan – a long-serving parish councillor and village hall committee member who funded the installation of the defibrillators in both villages – is a filled planter complete with a small plaque. This will be placed near the picnic bench, the installation of which Bryan part-funded, near Wansford bus shelter. The ceremony at Wansford Lock will start at 2pm to be followed by free light refreshments in Wansford Village Hall, with donations, if de-sired, to Wansford Village Hall funds. 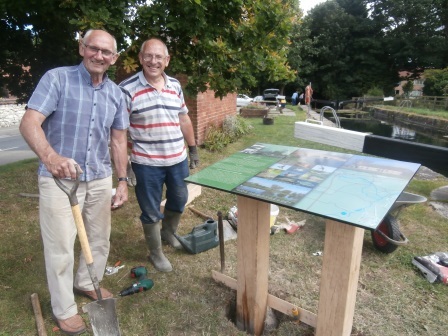 The interpretation board has been in place on the lock since June and has been seen to be attracting much interest from the many visitors to the village, who use the picnic table and generally enjoy the view of the lock and navigation. It was installed by Jim Stockwell and Keith Pick and was funded with grant aid from the Lissett Community Wind Farm Fund, Driffield Canal Partnership and Driffield Navigation. Skerne and Wansford Parish Council chairman Ian Lamble with Brian Kitt of the Driffield Navigation Trust. People gatheredfor the opening of the new path trail between Whinhill and Wansford Locks , which makes it possible for the walker to amble off-road alongside the canal between Driffield and Wansford for the first time in decades. 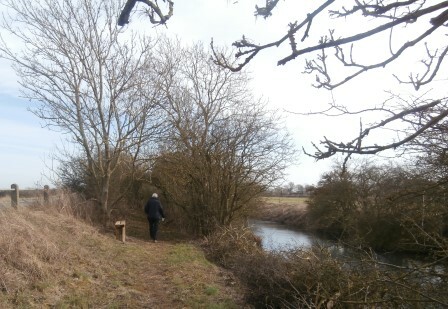 The path is the culmination of hard work from volunteers from the Inland Waterways recovery Group, Driffield Navigation Trust and the Driffield Canal Partnership. The official opening was carried out by Skerne and Wansford Parish Council chairman Ian Lamble, after which the assembled crown walked to Wansford, where afternoon tea was served in the Wansford Village Hall. Donations amounting £165.03, which will be put towards seating in Skerne, were made. 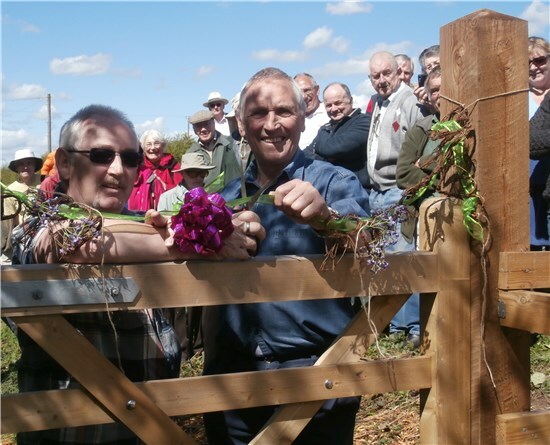 The newly created path trail linking Whinhill and Wansford locks will be officially opened in a ribbon cutting ceremony at Whinhill on Sunday April 26 at 1pm. Following the opening refreshments will be served in Wansford Village Hall from 1.30 to 4pm, with donations for seating of the Skerne section of the Riverhead, Driffield, to Bell Mills walk, of which the new path trail is a vital link. The path trail is a Driffield Canal Partnership and Driffield Navigation Trust initiative and its opening follows months of planning and sheer physical graft from canal enthusiasts, including members of the Waterways Recovery Group, who joined a summer camp last August to help out with the hard labour. 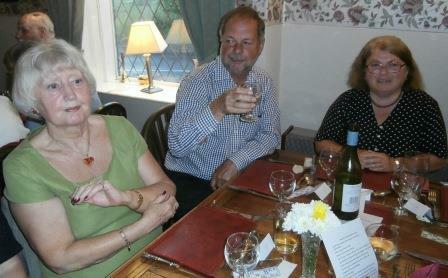 Sue and Chris Foster with, left, auctioneer Adrian Harrison and his wife, Caroline. 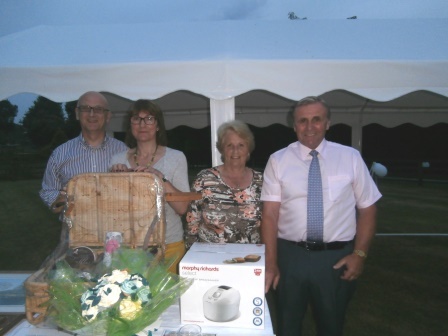 Yorkshire Cancer Research benefited by £3,040 when Wansford’s Chris Foster decided to celebrate his 70th birthday with a charity event at the family farm at Brigham. 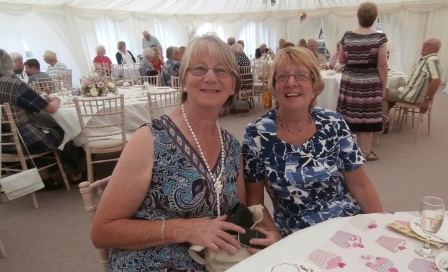 Jill Vint and Leslie Muir are pictured at an afternoon in aid of St Leonard's Church, Skerne, which raised £1,100. For more pictures of the event see the Image Gallery. Billy Waites, of Skerne, pictured with one of the defibrillators donated to Skerne and Wansford Parish Council by the Yorkshire Ambulance Service. They are to be mounted at Broadmead House, Skerne, and Wansford Village Hall. The first ever garage sale in Skerne, organised by Gemma Dixon, raised £362.50 for St Leonard's Church funds. For more pictures from the day visit the Image Gallery. 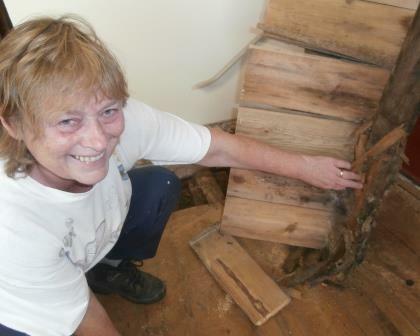 Judith Jarvis examining the rotting timbers beneath the village hall floorboards. Work has started on the task of renewing the Wansford Village Hall floor and some of the plasterwork. This is yet another stage in the ongoing renovation of the 150-year-hall, which started in 2010. The hall is now shut into the autumn. However the Wednesday village hall coffee mornings will continue safari-style in homes around the village. 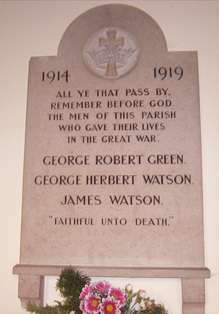 The war memorial at St Leonard's Church, Skerne, has been added to the UK National Inventory of War Memorials archive, which is under the auspices of the Imperial War Museum. About 40 villagers turned out to the extraordinary parish meeting at Wansford Village Hall called by the Skerne and Wansford Parish Council, which was attended by BT Group senior project manager David Calvert, who is working with the ERYC re BDUK (the Government’s broadband delivery programme), and BT Group business development director for the North Julia Watts. Those present were told that the parish would be in the last few per cent countrywide to receive an enhanced service but BT was working hard to ensure that ‘people like yourselves are not forgotten’. 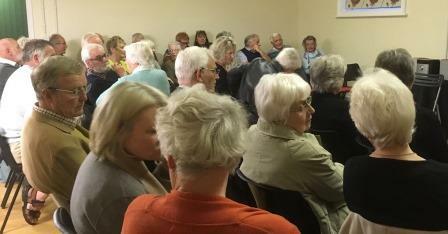 Ms Watts said the parish may be a candidate for inclusion in plans for a proposed extension of the current BDUK programme to provide superfast connectivity to those areas in the East Riding of Yorkshire currently not receiving broadband speeds of 15MB or over. This extension to the programme is subject to a range of factors including the availability of funding, however it is envisaged that these planning and contractual activities will conclude by summer 2015, at which time the situation for Skerne and Wansford should be clarified. In addition to possible inclusion in the new programme, BT is developing new technologies that could be utilised in the parish area to supply enhanced broadband services in the future. It had been initially thought that the deliver y of fibre optic to the cabinet in Wansford Road, Driffield, would have had a discernible effect on the provision for the parish, but line tests of numbers supplied by the parish council had indicated that this was not the case. There were many constraints that were considered under BT’s commercial rollout – not least the costs to site and provide power and fibre to cabinet locations, geographic challenges and the distance from the exchange. BT needed to ensure that fibre provision is commercially viable and research had indicated that often take-up of high-speed broadband options was in the region of only 20 per cent. However substantial Government funds were now available for the BDUK (Broadband Delivery UK) superfast extension scheme and Wansford and Skerne may be ideal locations for inclusion. Both ERYC and BT were acutely aware of Wansford and Skernes current situation and it was agreed that channels of communication between the parish council and BT would maintained to inform the PC of any developments. Parish councillor Lynn Stockwell and chairman Ian Lamble. 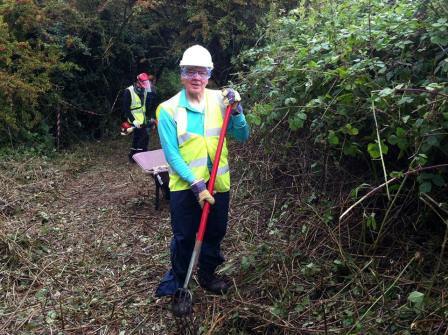 A canal side clean up took place at Wansfordo volunteers using spades, brushes and strimmers to give a the area around the bus shelter a new, improved look. For more pictures visit the Image Gallery section. MORE than £600 was raised at a fund-raising dinner in aid of the Wansford Village Hall restoration fund on Friday evening. More fund-raising initiatives are planned by the Wansford Village Hall committee in the hopes of raising cash to pay for a new floor, skirting boards and necessary re-plastering work to be done next year. Picture shows Karen McCann, Mike Barton and Lynn Stockwell at the event. 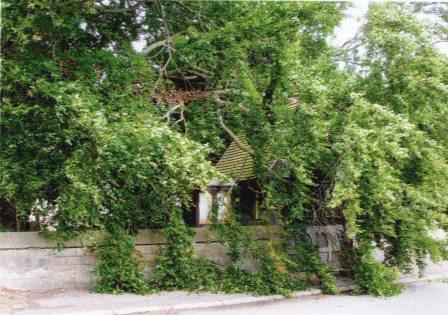 A branch of a beech tree in St Mary's Church yard, Wansford, broke off damaging the lych gate. A PERMANENT reminder of the Queen’s Diamond Jubilee is being positioned in Skerne. A new noticeboard was being put in place this week, complete with a bespoke bronze plaque commemorating the event, which was celebrated with joint activities in both villages over the jubilee weekend in June 2012. The noticeboard, which cost about £962 is being funded by the East Riding of Yorkshire Council Community Grants Fund, the Skerne and Wansford Parish Council and the villages’ jubilee fund. Wansford, complete with a similarly inscribed bronze plaque and which will be part funded by the parish council and the jubilee fund. The new noticeboard has been crafted in English oak by Driffield joiner Chris Greenlaw, a former Skerne resident. 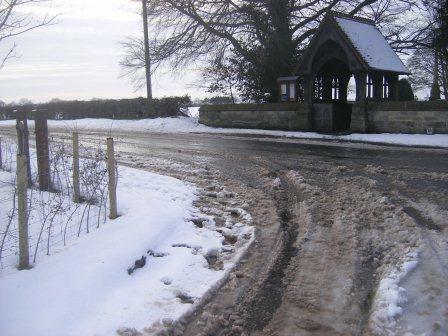 An Environment Agency flood warning was reinstated for low-lying farmland and properties around Wansford when a thaw set in over the weekend of January 26/27 following a prolonged cold and snowy spell. 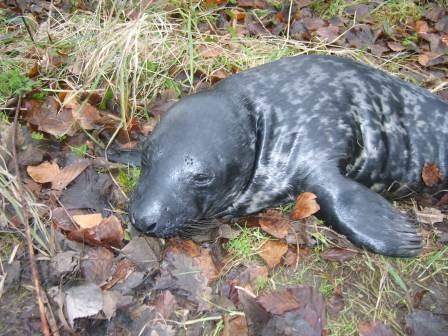 THE seal spotted in the canal at Wansford in December was eventually found at Nafferton and subsequently taken back to the North Sea and released. There was a flurry of excitement in Wansford when the baby seal was spotted near the Wansford lock. 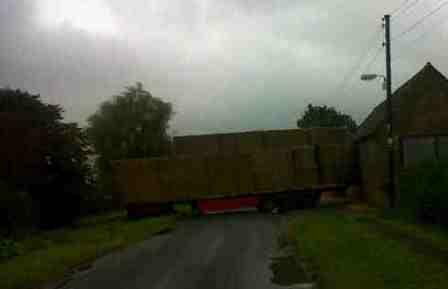 Traffic was brought to a halt in Wansford on September 24 when a tractor and articulated trailer laden with straw became stuck across the Wansford to Nafferton road outside Pleasant Wood Farm. Work on Wansford's Jubilee raft race entry is still on ongoing as the celebrations draw nearer. Pictured above are some residents at a recent workshop. 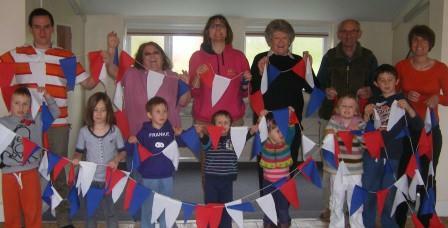 The villages' Diamond Jubilee Committee held a bunting workshop at Wansford Village Hall on Saturday April 21, Pictured are adults and children attending the event. The committee hopes that all residents will decorate their homes for the Diamond Jubilee celebrations in June. Skerne bus shelter has been revamped. Ian Lamble, chairman of Skerne and Wansford Parish Council, with some help from Skerne resident Brian Terry, has renovated the dilapidated bus shelter in Main Street, hopefully extending its life. 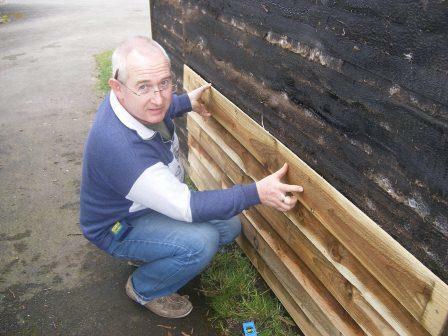 Coun Lamble, pictured above at work in Skerne, refurbished the Wansford bus shelter last year. outside on the new-look hall. 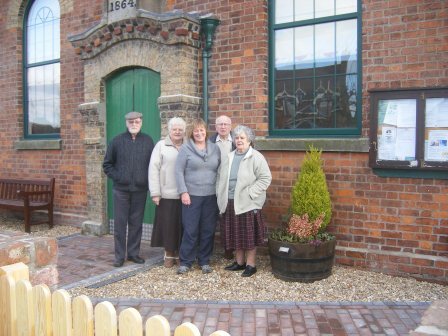 Improvements to the frontage of Wansford Village Hall have been completed. Paved pathways and a gravelled area replace the former concrete entrance and a secure fence has been erected, which will make the hall safer for users - especially children. In the interior, new curtains at the windows add to the atmosphere of the all, which underwent a major refurbishment in 2010. The village hall remains available for hire: for more details contact Mrs Mary Hudson on 01377 254760. 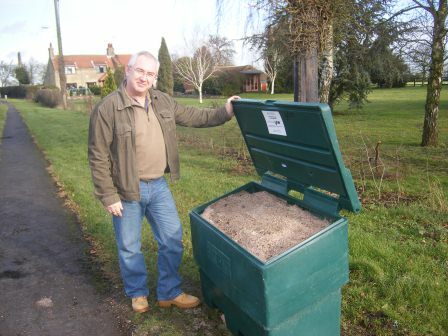 Two new, ERYC grant-funded grit bins have been installed in Skerne and Wansford. The Wansford bin is in Nafferton Road, north of Carr Lane, and the Skerne bin is inthe southern courner of main Street and West End. Te bins are for community use on a self-help, best endeavours basis. For more information on usage of the bins refer to the Skerne and Wansford Parish Council's severe weather policy , which can be accessed by clicking here. The PCSO for Skerne and Wansford is PCSO Chris Webster, who can be contacted by e-mail at christopher.webster@humberside.pnn.police.ukor by calling the police non-emergency number 101. Contact details and other information about Humberside Police can be found on the Useful Websites page of the Links section of this website or by clicking here.